Backyard Poultry Forum • View topic - Photo Comp # 22 BIRDS ON THE MOVE - Entries posted! 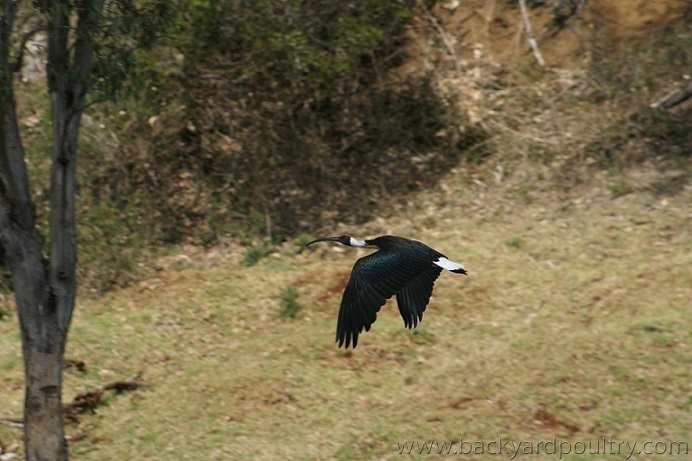 Photo Comp # 22 BIRDS ON THE MOVE - Entries posted! That's generous, will get something tomorrow - and probably with some rain-spots on the lens but that's to be happy about after the past five months. Good idea on the extension, as weekends are usually when people have more time for all things chook-related! Can't wait to see the entries, I hope there are heaps of them! We did have one more entry for the comp that I want to share with you all - it cant actually be entered into the comp because its not stricktly Poultry - but all the same it really is a great photo of birds on the move. Poll & voting not open yet? Post subject: Re: Photo Comp # 22 BIRDS ON THE MOVE - Entries posted! Is it an ibis? You can see a beautiful green sheen on the feathers. It doesn't look anything like the grotty examples that hang around the dump near us.